Men’s fashion typically does not lend itself to boldness. A good suit paired with polished dress shoes is a classic look sported by many. It’s a look that works. That’s why it so popular. Going with what’s conventional is an approach many men have taken when it comes to fashion. However, there is also something to be said about being bold and out of the box. Fortune favors the bold as they say. With regards to men’s shoes, that sentiment is perhaps best embodied by Belvedere’s Batta. There is nothing subtle about the Batta’s look. 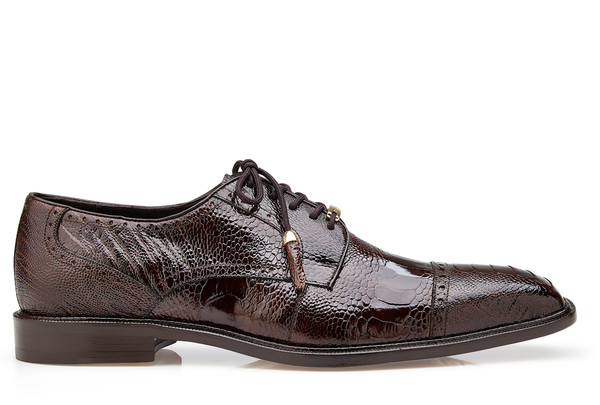 The ostrich leather features an unmistakable luster that cannot help but draw attention. The Batta does more than attract attention however. It also captivates expertly. It manages to do so with the distinctive patterning found all over its body. Fine detailing goes into the toe cap. The natural structure of the leather is emphasized because the shoemakers understand that material so exquisite is celebrated and not hidden. A small line of demarcation defines where the toe cap ends and the rest of the shoe begins. Further down the shoe, multiple techniques are employed in order to bring out the best of the ostrich leather’s appeal. The leather expands to cover the longest expanse of the shoe. The detailing is not as prominent but the high quality of the material used for the Batta remains on full display in this segment of the shoe. The gorgeous detailing is then utilized to cover the rest of the shoe, but small variations in the patterns work against monotony and instead create something that is not just visually appealing but interesting too. Additional embellishments on the laces and the tongue of the Batta serve to further drive home the bold sense of style that this shoe embodies. Simple is not a word that can be used to accurately describe the Batta’s elaborately crafted body, but that is far from a negative. The Batta is a statement piece, and one that conveys the message of boldness loudly and clearly. What can men do with a stylish shoe like the Batta? Only their imaginations can limit them. The Batta is not intended to go with the classic men’s ensemble, but what it can do is act as the finishing flourish a look that is otherwise understated. Go with the black or gray variants of the Batta to contrast more conventional ensembles. The contrast will be evident but welcome and will turn what could have been a potentially boring outfit into something decidedly more exciting. The chocolate and olive variants of the Batta work best for this fall season. They are more daring choices for sure, but their fit with the fall motif is so seamless that they demand to be worn. Belts offered by Belvedere such as the Ostrich Leg Belt in Olive and the Ostrich Quill Belt in Gray are ideal complements to some of the Batta variants. Save them for a night out to create a look that is memorable and bold in all the best ways.